(a) Admit card. Black and White LASER Printed Admit Card is required which they willcarry to the rally site for admission into the rally ground. (b) Education Certificate. Registration Card, admit Card, marks Sheets and Board Certificates of X, XII and Graduation from recognized Board & University. SLC and CLC may be asked for and all candidates will carry the SLC & CLC. Provisional Certificate of Xth & XIIth passed candidates will only be accepted for Academic Yr 2015 onwards. Subject and minimum 45%, C-2 grade OR 4.75 points in aggregate OR 10+2 Simple pass. Category & ST Category (Adivasi). (a) Candidates are advised to get themselves medically examined before coming for selection In respect of vision and minor ailments. They are also advised to have the teeth stains and wax from ears cleaned. (b) Candidates found at any stage with distinguishing marks/color/telephone numbers on undergarments/body parts/documents/photographs will be immediately rejected. (c) Candidates to bring a pair of new undergarments on the day of medical. 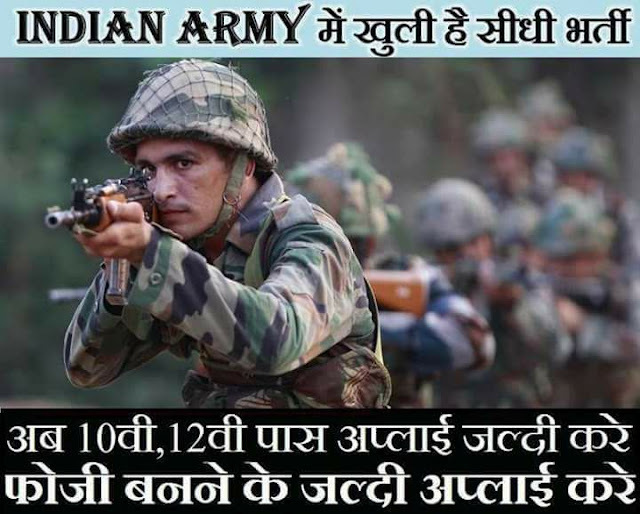 (a) Married candidates of below 21 years of age are not eligible for enrolment into the Army. (b) Small decent Tattoo only on ‘inner face of the any of the forearms and back part of the palm is permitted. Tattoo on any other part of body is NOT PERMITTED. (c) Candidates are advised not to submit/produce fake documents. On production of fake documents, FIR will be lodged and the candidate will be handed over to Police along with all the documents. (d) During the rally, candidate will be responsible for any accident/injury that he sustains. Army will not be responsible for any mishappening during the Run, other physical and Medical tests. (b) Only those candidates having valid Admit Cards will be allowed to participate in rally. 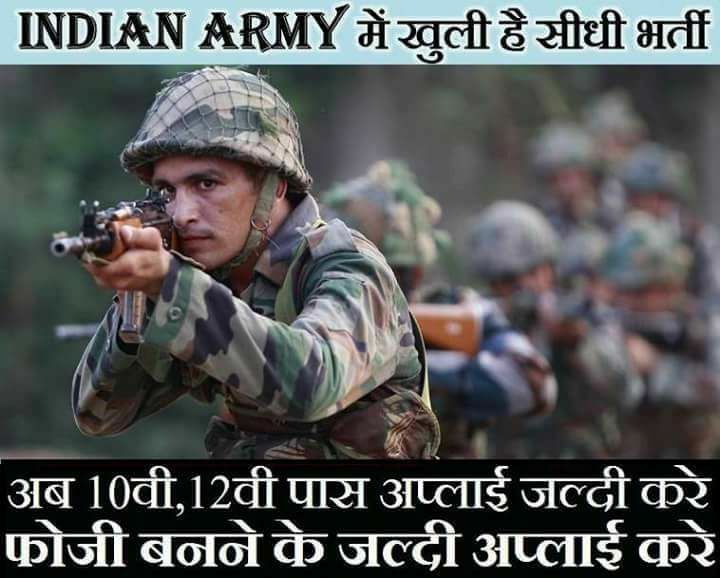 (c) Admit Cards will be available on Indian Army site only after 23 Dec 2017. Candidate will take the printout of Admit card from Black & White laser Printer only. 3. RALLY PROGRAMME. The detailed rally programmer (Day Wise) will be published separately later in Newspapers after 23 Dec 2017 to 03 Jan 2018 and the date of rally will also be reflected on the Admit Cards. How to apply: Eligible applicant require to send their applications in the prescribed format fficial website www.joinindianarmy.nic.in. Before or on 07.11. To 23.12.2017. Write on the envelope “application for the post of Soldier”.